"If your Windows Phone 7 device contains an SD card, you should think of it as a permanent component of your phone, not as removable storage. The Windows Phone 7 operating system treats the SD card as an integrated part of the phone. This is in contrast to other devices, where you can use an SD card to increase the memory available to the device at any time or to transfer files to other devices"
It's all a blob to Windows Phone 7, your storage that is. 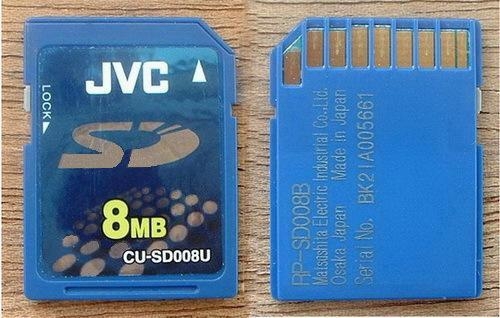 Add an SD card (if you have a slot) and you get more storage (just please use a card a bit bigger than the one shown above - can you believe they still sell those?!? ), but gone are the days of popping multiple cards in or out on a whim. So there you have it partner, straight from the Microsoft Knowledge Bases' Mouth. I inserted a 16Gb Class 2 card in my Samsung Focus before I turned it on for the first time. The phone went through its set-up but did not recognize the card. I did not follow the instructions in the Quick Start Guide that came with the phone, but instead did a simply reset of the phone. It went through the set-up process again, but this time it saw the card. That is kind of odd, but it works. There have been no issues at all thus far.